The player is the same HTML5 player used in the Kaltura open-source video platform. It has been integrated with MediaWiki (the software that runs Wikimedia sites like Wikipedia) through an extension called TimedMediaHandler. It replaces an older Ogg-only player that has been in use since 2007. 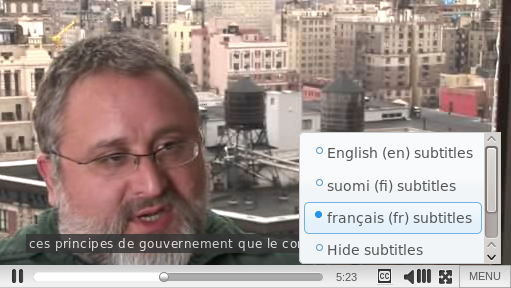 The new player supports closed captions in multiple languages. Based on HTML5, the new player plays audio and video files on wiki pages. It brings many new features, like advanced support for closed captions and other timed text. By allowing contributors to transcribe videos, the new player is a significant step towards accessibility for hearing-impaired Wikipedia readers. Captions can easily be translated into many languages, thus expanding their potential audience. TimedMediaHandler also comes with other useful features, like support for the royalty-free WebM video format. Support for WebM makes it possible to seamlessly import videos encoded to that format, such as freely-licensed content from YouTube's massive library. Even further behind the scenes, TimedMediaHandler adds support for server-side transcoding, i.e. the ability to convert from one video format to another, in order to deliver the appropriate video stream to the user depending on their bandwidth and the size of the player. For example, support for mobile formats is available, although it is not currently enabled. The player's "Share" feature provides a short snippet of code to directly embed videos from Wikimedia Commons in web pages and blog posts, as is the case here. Sponsored by Kaltura and Google, developers Michael Dale and Jan Gerber are the main architects of the successful launch of the new player. With the support of the Wikimedia Foundation's engineering team and Kaltura, they have gone through numerous cycles of development, review and testing to finally release the fruits of years of work. Efforts to better integrate video content to Wikipedia and its sister sites date back to early 2008, when Kaltura and the Wikimedia Foundation announced their first collaborative video experiment. Since then, incremental improvements have been released, but the deployment of TimedMediaHandler is the most significant achievement to date. Some features provided by TimedMediaHandler have been available to users of Wikimedia Commons during development, in experimental mode. Registered users could enable the beta features in their personal preferences to enjoy a nicer interface and edit subtitles. Since the new player is compatible with existing subtitles created during that time, there is an existing body of captions that it can already load and display, like on this mash-up of interviews of Wikipedians. Wikimedia Commons is the central media repository for Wikipedia and its sister sites. It acts as an archive for all their multimedia content; even if a video is also hosted elsewhere, Wikimedia sites need their own copy to ensure that the resource remains available even if third-party sites disappear. From a privacy perspective, it also ensures that the users' personal information is not shared with third-party hosting platforms. The new player also complies with free media licenses by displaying author information at the end of the video, wherever it is embedded. This commitment comes with its set of complex technical challenges. For many websites, displaying a video is as easy as embedding it from a popular hosting platform like YouTube or Vimeo. By simply using a short bit of HTML code, any blogger can embed a video directly into their web page, without having to worry about disk space, codecs, browser support or bandwidth. Although Wikimedia sites are a much more modest video hosting platform, they still need to address these complex issues. For example, engineers at the Wikimedia Foundation have been engaged in a long overhaul of their media storage infrastructure, to keep up with the increasing demand in storage space for multimedia content. More recently, they have also been improving the efficiency of their caching servers to deliver large videos. The challenges of preparing for more multimedia and video content on Wikipedia are not limited to delivering content to readers: uploading these videos in the first place is just as important, due to the participatory nature of Wikimedia sites. Contributing quality original videos to Wikipedia is arguably much harder than editing text on a wiki page. In 2010, the Open Video Alliance launched a campaign called "Let's Get Video on Wikipedia". The project aimed to motivate more people to take and upload relevant educational video content to Wikimedia Commons. It featured a tutorial and an experimental wizard to insert videos into Wikipedia articles. The UploadWizard, a step-by-step upload assistant developed by the Wikimedia Foundation in 2010-2011, has been critical to making multimedia participation more accessible and intuitive. Further improvements are underway that will facilitate video contribution, like the currently experimental chunked uploading feature, that allows for more reliable transfers of large files. On the internet, video is a very static medium: it rarely changes once uploaded. In contrast, the success of Wikipedia relies on numerous volunteers constantly editing and improving each others contributions. Appropriate tools will hopefully reduce this dissonance, like Kaltura's sequencer, which empowers users to remix videos directly online. Successfully translating its radically collaborative nature to multimedia content will be critical to Wikipedia's transition into the age of video.